As Hob and the Mutanimals head for Null’s lab, Mutagen Man manages to cause a chemical spill that initiates a shutdown, trapping all the guards and scientists inside. Lindsey and Jillian try to talk him out of self-detonating, but he’s sure it’s the only way to stop them. The Mutanimals arrive and break open the entrance, allowing the humans to escape. Hob tells Mutagen Man that if he follows through on murdering innocent people, then he’ll be the monster Null wanted him to be. Mutagen Man reconsiders, but can’t stop his suit from exploding. Luckily, Lindsey figures out how to deactivate it. As the Mutanimals reconvene, Lindsey offers to work with them to stop Null, even if Hob doesn’t trust her. Hob comes up with a plan. Later, Sally Pride gets the Mutanimals into Null’s skyscraper headquarter by landing a stolen helicopter on the roof. Hob goes to see Null for a talk while Lindsey and Jillian hit the server room and the other Mutanimals keep the robot guards (Roadkill Rodneys) busy. Once Lindsey and Jillian steal all Null’s data and incriminating evidence and then wipe the company’s files clean, Lindsey socks her ex-girlfriend in the face. Tying Jillian up, Lindsey leaves her behind to be dealt with by Null, as she no longer trusts her to make the right choices. 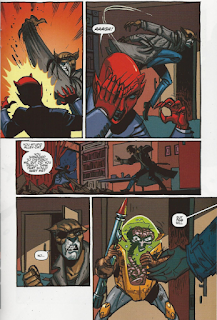 In Null’s office, the devil lady begins beating the tar out of Hob, telling him that her business is interdimensional and nothing he has done has put more than a slight dent in her profits. Even now, her guards have the Mutanimals pinned down and soon his “war” will be over before it even began. 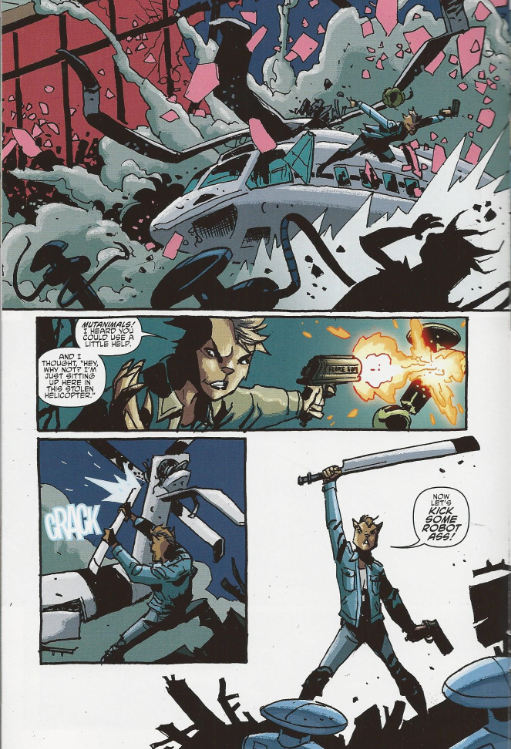 Sally crashes the chopper through the side of the building, taking out several of the Roadkill Rodneys and giving the Mutanimals time to rally. Meanwhile, Hob slashes Null across the face. Even though she’s immortal, he can still hurt her. In fact, with everything they’ve accomplished, he will get her where it really hurts: The profit line. The evidence of her company’s wrongdoings is sent to the media, the wiped files will set her back for years, and he and the Mutanimals will always be there to cut her off if she ever tries to mess with Mutants again. And just to drive the point home, Mutagen Man shows up and blasts her in the chest with a rocket launcher. The Mutanimals promptly escape. At Mutanimals HQ, Sally sees to everyone’s wounds. While treating Lindsey, she tells her that the real reason Lindsey doesn’t feel accepted among the Mutanimals isn’t because she’s a human, but because she doesn’t open up and tell everyone else how she’s feeling. Lindsey considers Sally’s advice. Outside, Hob meets with Ray and the cat tells the fish that if he doesn’t feel comfortable in the field, he can use his intellect to help their cause in other ways. Ray says that despite being an egghead, he finds field work helps him get his aggression out. In fact, he wants to be even MORE proactive. Hob agrees, but figures they should keep Slash in the dark about it for now, as he’s still recovering from his earlier meltdown. With that over with, the Mutanimals all sit down to dinner and celebrate a successful start to their campaign. *This story is continued from Mutanimals #3. *The Roadkill Rodneys were, of course, enemies featured in the first season of the Fred Wolf TMNT animated series and as antagonists in the Konami video games. *This issue was originally printed with a 5-page preview of Onyx #0. *This issue was originally published with 2 variant covers: Cover A by Kuhn and Filardi, Subscription Cover by Ben Bates. That was a strong conclusion to an overall excellent miniseries. 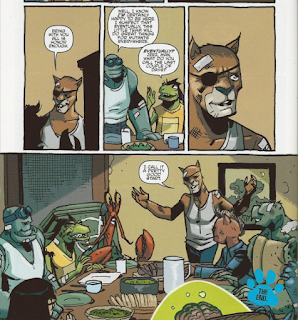 As with the original Mutanimals miniseries, I do hope this one spins out into its own ongoing, or at least another mini to maybe test the waters. These continue to be great characters, but since there’s so many of them, there’s really no way they can shine as cameo guests in the TMNT ongoing. That book is already drowning in an overabundance of co-stars; a sudden injection of 8 more would send it plummeting to the bottom of the Atlantic. Hey, let’s talk about Hob for a moment. He’s come such a long way, hasn’t he? Not just in terms of importance, intellect and threat-level, but I mean in genuine character development. He really grows and changes over the course of this series, at least in terms of his world view and philosophy. Recall how he acted in the “New Mutant Order” arc, which essentially debuted the Mutanimals in the IDW series. He straight up wanted to kill Bebop and Rocksteady just because they had been humans at one point. His hatred of humans was fairly shallow and he operated in stark black and white, letting his emotions override his judgment. But over the course of this mini, you see him and his outlook change. Losing Lindsey makes him realize how much he values humans and needs their help, and how he’s better off cooperating with the best of them as opposed to making more enemies. He and Lindsey aren’t exactly friends by the end of the mini (she still betrayed him), but he also comes to understand that she might not have left had he treated her better. Old Hob, if he’s anything, he’s pragmatic and opportunistic. He knows that mistreating his teammates is not the way to get the best performance out of them, and even if Lindsey is a human, she’s still a member of the Mutanimals and deserves to be treated as well as anyone else. It’s fantastically consistent with his character, who has patiently grown and schemed and evolved over the course of the series, but always in reaction to his trial and error failures and successes. 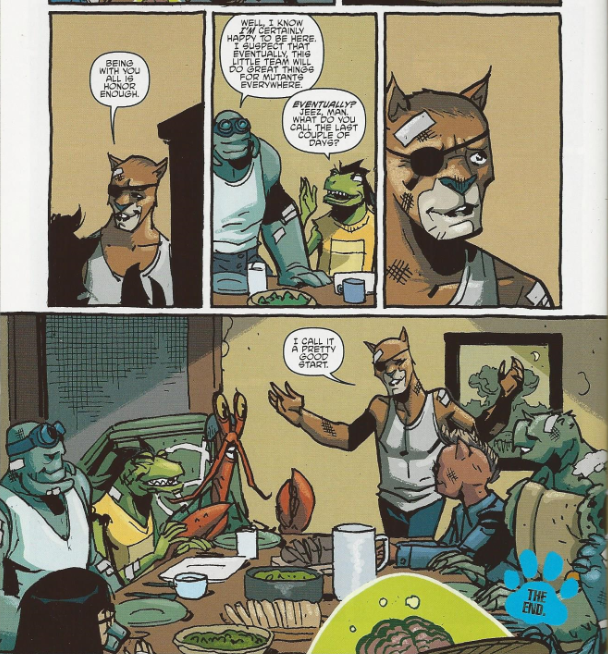 Old Hob is one of the best characters in IDW’s TMNT universe, maybe a contender for THE best, and I find his growth fascinating. The IDW guys have done amazing things with him. I was also grateful that Mutagen Man didn’t explode. Flippantly killing off characters is something that’s become very vogue in comics over the past few decades and I positively cannot stand it. When you kill a character for “shock”, you eliminate all potential that character might have had and close the door on so many possible stories. If they’d introduced Mutagen Man just to kill him off a few issues later, I’d have been livid. But no, Allor ties it all up with a throwback to Hob’s and Slash’s earlier argument about “any means necessary” and not only does it save Mutagen Man from an early grave, but it’s also the big moment where Hob realizes he’s been wrong all this time. And that’s another thing. These Mutanimals feel integrated. They reflect off of one another and interact differently and help each other grow. The original Mutanimals from the Archie series; those characters almost felt disjointed or separated from one another. They were a team, but not really a family and everyone was kind of isolated. But here, Hob’s relationship with Slash is different from his relationship with Mutagen Man. Sally’s relationship with Lindsey is different from her relationship with Ray. Mondo’s relationship with Pete is different from his relationship with Herman. And so on. It’s THAT sort of thing that makes these characters feel like they’re all a tight knit unit rather than solo acts bumpered by invisible personality force fields. The new faces also get a little basic characterization, too. Sally already had her love of driving and piloting dropped in the previous issue, but now we get to see it as well as a softer side to her wild girl persona (her one-on-one with Lindsey). Ray finally gets something to work with, as we learn that he’s highly intelligent (previously, we’d only known that he was patient and pensive). It’s something. Ray also seems to be usurping Slash as Hob’s second-in-command in light of Slash’s losing control. That could facilitate some drama down the line, but also give Ray a chance to do something that matters. As for Null, she’s still a mystery. 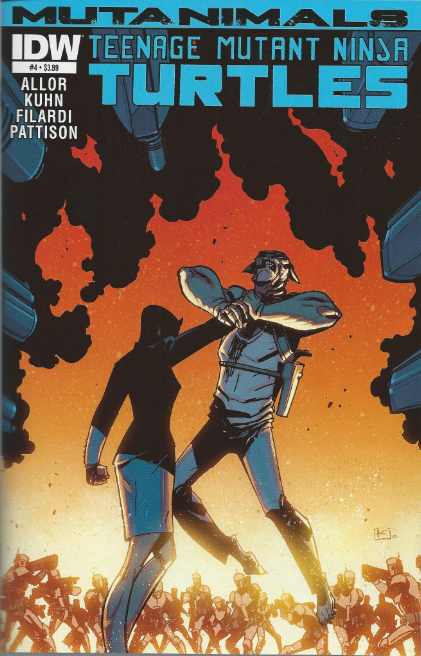 I guess I wasn’t expecting her whole origin and deal to be dropped on us with this issue, but maybe I was anticipating a little bit more than, well, nothing. I think the only tidbit we got was that her business is interdimensional, which could mean a lot of things. I wonder how she deals with the public, though? Does she wear makeup and a hat over her horns? These things must be revealed. Andy Kuhn’s art in this issue seems rushed and a little messy in places (Page 9 is pretty rough). There are also two colorists on this issue (though you can’t tell their pages apart). It looks like maybe folks fell behind or something and things had to be hurried; I dunno. Not that the issue looks BAD or anything, but it does have some sloppy marks here and there. 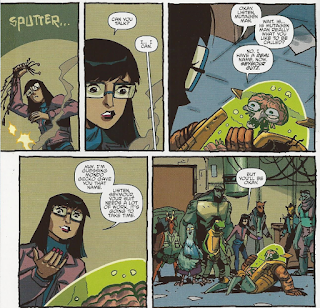 All in all, Mutanimals was another terrific miniseries. IDW has really been knocking these out of the park ever since they started. What’s more is that the Mutanimals feel as interesting and three-dimensional as the Turtles do in the main title. It leaves me craving a Mutanimals ongoing, at least under the condition that they keep the writing up to this standard. I think Hob has changed some but not to the extent that it seems when he's talking mutagen man out of killing himself. The end scene with him talking to Man Ray shows that Hobs human kills might be stealthy down the road. I like that Man Ray seems like he s almost as ruthless as Hob when it comes to dealing with people who experiment on mutants. I can't wait to see what happens with his character.